Loved this tent, spent a good portion of the last 12 years in it. Twelve years, a few hundred nights, more than a few hundred miles, tons of memories and good times. After all that, a few reseal jobs, and some duct taped accidents, she finally gave up the ghost after remnants of Hurricane Nate were her match. Moisture seeping through the floor, recently resealed fly still leaking, a pole snapped. But with all that, and an emergency poncho over the pole hole, I still stayed dry in six inches of of stormy rain. And after proper and somber disposal, Old Blue is replaced by Big Orange, a Marmot Limelight 3P, Wife and I do like spacious comfort. Will be our go-to car camper, yet light enough to hike with. Welcome to Trailspace, Matt! Thanks for sharing your first review with us. I'd love to see some pictures of your tent on its adventures in your review. Also, what will you replace it with? Thanks for the pictures, Matt. I hope the new tent is as great as the old one. Do my eyes deceive me? Is that not a picture of a T.A.G. Fall Cave-In site? Hurricane Nate ruined Sunday caving this year! Matt Fischer The first pic is actually the 2016 Florida Cave Cavort (March, in Havana), the second one is my basement two days ago (snicker). It was the best pic of old Blue I could find quickly. BUT... your assumption about T.A.G. Fall Cave-In and Hurricane Nate are correct: was there caving and cavorting and enjoying the general mayhem again this year (started Fall Cave In attendance in the '80s). Was nice to see that the bonfire we didn't get to burn last year had "cured nicely", it was a barn-burner. And yes, along with my tent, Nate definitely ruined Sunday caving this year: I bugged out right after the Rescue Breakfast, when there was enough rain gap to get to my car. Just finally stowed the last of my cave gear yesterday. Lots of drying fan time in the garage. Had this tent for a while before my new hammock, but hands down the the tent I have ever owned. Still use it for harsh winter camping. My Scouts' parents bought this tent for me when the boys crossed over into the troop. It's roomy for one person. And the built-in gear loft is great. The vestibule is a little small. I use it for harsh winter camping. At 5 lb 14 oz. it is heavy, but you can use the pitch light system using only the rain fly, poles, and footprint, "leaving the tent body at home." Hands down the easiest tent I've ever had to set up, even in the dark. The tent holds up great even in 6 inches of snow. I've had this tent for roughly a year now. I'd say I'm still quite pleased with it. I've gone on two or three trips with it and it's held up great so far. My biggest problem with it is the condensation. I think it would be better without the rain fly, but the weather always seems questionable when I set it up and so I always end up putting it on. The next morning the rain fly is soaked and so I have to kill time waiting for it to dry before packing up. My girlfriend also has complained about the large size of the tent, I'm OK with it though. 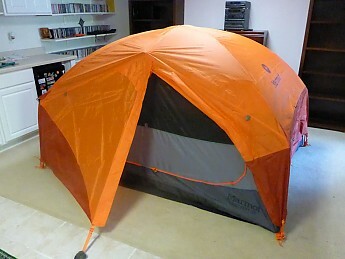 I've tested a lot of the smaller, lighter tents she thinks are better, and they seemed flimsy to me. I'd rather have a tent that's tough as nails and maybe a bit bigger than have a light weight one and worry about it tearing in the field. Set up and packing with this tent are also fantastic. Takes ten minutes at most. 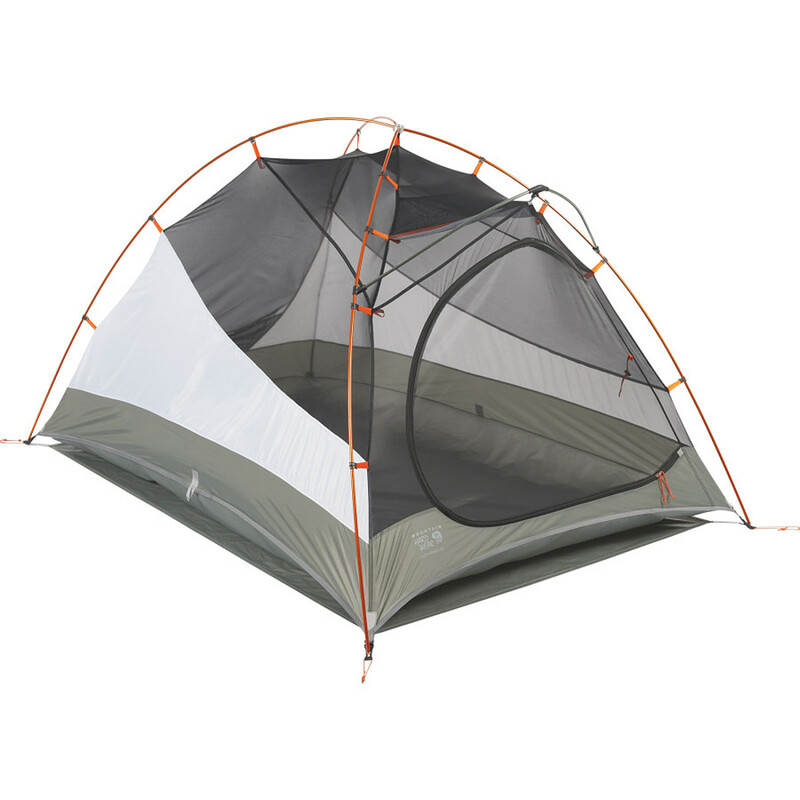 Also, this is somewhat big for a 2 person backpacking tent, but for any of you who are new to this, don't expect to be sleeping next to someone in it unless you're really comfortable with that person, because you'll definitely be all up in each others' business. 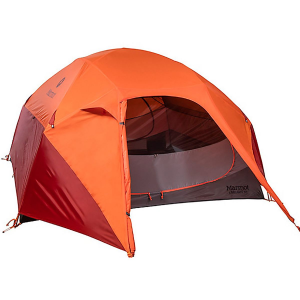 I bought this tent with priorities being 1) Waterproof and 2) Ease and quickness of setup. 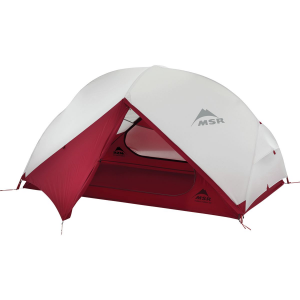 After using this tent I am extremely happy with it as it has satisfied both of these. The 3 pole design is intuitive allowing for quick and easy setup and take down, while the near complete coverage of the rain fly prevents any rain from getting in even in strong storms. I would suggest getting the footprint as it is cut perfectly for the tent and provides a confident barrier. The tent is labeled as having a 2 person capacity which with little to no gear it MAY be able to do but me (6'1" 185 LBS) with a mummy bag, sleeping mat, and gear, fit comfortably. 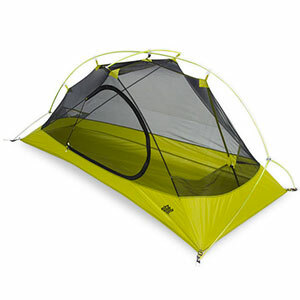 I have used this tent only in base-camping but I will be using it in backpacking trips in the near future. 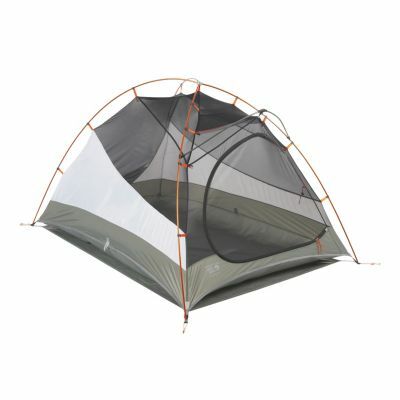 I bought this tent at a very low price which I thought would compensate for the "weightiness" of it for backpacking. I have absolutely no complaints (OK, if I'm real picky it is slightly awkward to put up solo). I love the practicality (over-entrance shelf, vestibule, pockets, loft loops, totally water proof), but the fact that I trust it tops everything else. I've used it for 2 years for backpacking, kayaking and car camping and have never had a problem with it. I love this tent. I am 6'2" and I fit very well inside. I love this tent. I am 6'2" and I fit very well inside. I love the vestibule where you can sit half in the tent and slip off your boots keeping the tent clean and dry. Great ventilation and window. It sets up in less than five minutes, stands strong and looks great. I recommend the matching foot print to protect the floor. I have used this tent for all seasons. On first use we were in an ice storm and it held up perfectly. My hubby is a 6' non-camper and he was very comfortable in this tent. 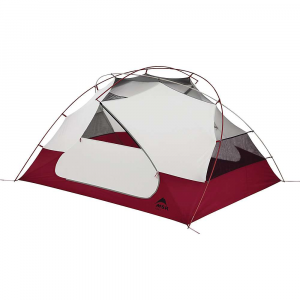 I like to camp light, warm and dry, so this tent suits my needs very well. Caveat: I only set this tent up in our yard, as my trailworking season does not re-new till next spring. That being said, I set it up during a week long period in which we received the rain-out from 2 tropical depressions/storms. All types of rain at varying speed, from mist to downpour came down, and the tent remained watertight. I am very impressed also with ease of set-up and take down. More room length-wise than breadth but adequate for the two of us with equipment, including trail tools, whether kept inside, or in vestibule. The zipper on the fly for the entrance was a bit sticky but passable. I would give this 5 stars but for the fact I have yet to use it on trail. Spent a LONG time shopping for this, was worth wait as thus far I'm very happy with it. Ease of Setup: none if not disturbed by strong wind. On my request a friend in the US purchased for me this tent in July 2007. I have used it the first time in September in Chamonix, France, exactly when a three-day really strong wind made life miserable day and night to all campers in the area. Because of the wind, it took me more than 30 minutes to pitch the tent but once in place I can assure it was rock solid. 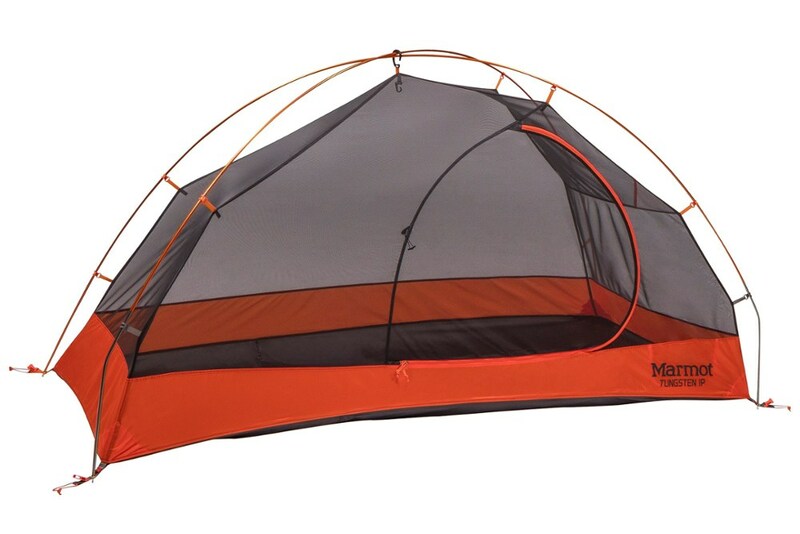 In spite of the wind and all noise, I felt comfortable and secure and decided this had to be the tent I will carry during my hiking and motorcycling trips in Europe, where I live. Great buy at a reasonable price, paid in Euros. As the previous hiker says, this is a good tent for someone 6'2". The vestibule is perfect for taking off muddy boots at the 'front door'. 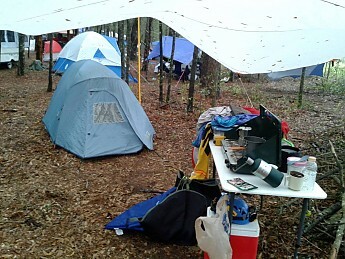 I have camped in WMNF in NH during the fall and have remained dry throughout many rains. The Mountain Hardwear Light Wedge 2 is not available from the stores we monitor. It was last seen January 12, 2017	at SunnySports.